I am only looking for a pet. I have no intentions on showing. I just want a healthy happy puppy. I do not even understand pedigrees. Who cares? You always here "I only want a pet why should I care about the puppies pedigree?".... Well... There are many reasons why an impressive pedigree makes a difference. The puppy that you decide to purchase comes not only from the breeder that you buy from, but that puppy comes from the breedings of all the other breeders on your puppies pedigree. The farther back you go, the less significant that breeders influence is, but the results of years of breeding DOES influence the health of your puppy in either a positive or a negative way. 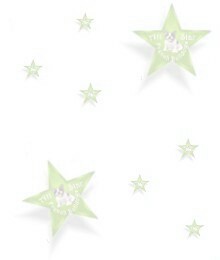 Not only does it reflect the health of your puppy, it also helps determine the disposition of your puppy. In order to finish a dog as a Champion, that dog has to be judged by several different judges at several different shows. In order to win over the judges, that dog has to have more than just certain physical qualities. The dog also has to have a great personality. A dog's temperament is not only influenced by the way the breeder raised the puppy or the way the owner finished raising the puppy into a dog. The temperament also has a lot to do with the temperament of the ancestors. Show dogs that strut their tails high and proud and are the star of any room they enter do not get that way as a result of improper breeding. It takes skill you can only get from years of experience to produce a show dog. Another important reason for seeking a puppy that has an impressive pedigree and perhaps much more important is this: Dogs do not become champions if the person that is behind that dog is not respected by his or her peers. This is important. In order to have a reputation that allows you to win over the judges, you cannot be the type of person that does not stand behind your dogs. Think about it... If you are known as the type of breeder that does not breed healthy dogs the word will eventually get around. 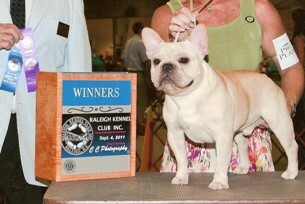 You will be known as an unethical breeder and you will not have enough respect to finish any dog to it's Championship. 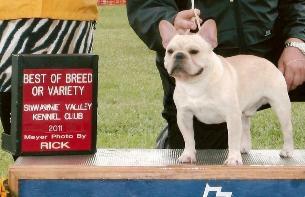 When you see a pedigree that is loaded with champions, you are seeing years of good breeding and experience, in my opinion, we hope to have this in the French Bulldog breed. Reputable breeders stand by their dogs and try as hard as possible to produce the best quality puppies they can. Although you cannot guarantee 100% that a Champion will not throw a dog with genetic faults, your chances of getting a HIGHER QUALITY dog are increased when you get one from reputable breeders. Breeders that buy any Frenchie they can find for cheap, imported or from puppy mills and breed them are the type of breeders that do not care about what they are producing. They just want to have puppies that they can sell to make money. As long as they can sell the puppy, that is all that matters. They do not have to worry about vet bills that accumulate months later because they do not provide or stand by health warrantees. Once the puppy leaves, the headache is someone else's. Reputable breeders do not operate like this. They stand by their puppies and should give you at least a 1 yr Warranty. Therefore, it is in their best interest to raise only healthy puppies. Not every good dog is shown and this is something people need to realize. There are some dogs that breeders "choose" to leave for breeding purposes only for a number of reasons. There are some dogs that don't like the show ring no matter what you try, not every dog is meant to be a show dog even if it has perfect conformation. Showing dogs through the AKC is expensive and time consuming and some folks may not have the funds and time. Obviously not every single dog in the pedigree has to be a Champion, even in very active Show Kennels, not every dog is shown and those that tell you otherwise are lying. For the most part you should look for a puppy with a nice pedigree with the "lineage" to back him/her up. The Ancestors of our dogs do mean something. I have seen people selling Frenchie puppies without one single champion in a 4 generation pedigree for the same price if not more. I feel pedigrees matter and you should feel the same way even if you are only buying a pet. I hope by reading this some people can appreciate the CH in a pedigree and what it takes to show a dog to it's Championship. I do admire and respect all reputable Show Kennels as it is VERY hard work. Some people out there will tell you the dog is AKC REGISTERED and then you find out it's only APRI (American Pet Registry, Inc) Registered or FCI Registered, or some other made up foreign registry which are NOT the same as AKC. Be Careful! All Star Disclaimer: We do not claim to be experts & by listing any information on this page or any page on our site we are not giving expert advice. We have owned Bullies for decades and French Bulldogs for years now, but feel no matter how many years you have in anything, you can never know enough and there is always something new to learn. We do not claim that the information on this website will guarantee that it is correct with anyone else's French Bulldog experience. Please do not use any links or pages on our website to make your decision. Remember that different breeders and owners have different opinions and often disagree. Frenchies vary in personalities and there can always be an exception to what is normal for the breed, therefore you must understand this BEFORE purchasing one. We place these articles on our website for the public to read, as information, not FACTS. 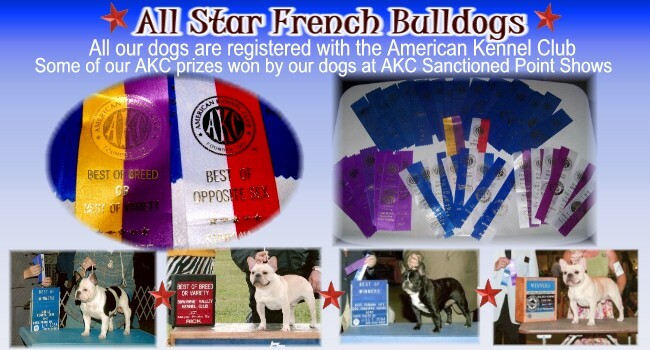 We found this information online, through web sites, our own experience, friends experiences, things we have been told from other Frenchie owners, etc. If we state certain methods we have used or use or have experienced with our own Frenchies, we do not wish to infringe these methods or opinions on anyone else, it is solely our opinion and nothing else. This is America, we do have Freedom of Speech and we are all entitled to an opinion. By reading, and/or using the material contained herein, reader or user of this information fully understands the above and again agrees to utilize this information at your own risk.